How to cook Bitters and Bologie (Saturday Plasas)? 1. Clean tripe and wash meat and cut into portions. 2. Put tripe and meat in a saucepan to steam adding ground ogeri/maggi cubes, some ground onion and salt. 3. Add 1pt, Water and continue to boil for about one hour. Add some of the prepared fish. 4. Add prepared bitter leaf and bologie. 5. Add palm oil and continue boiling. 6. Add prepared egusi and rest of the onions. Check the seasonings. More salt and pepper could be added according to taste. 7. Add the rest of the fish and simmer for hour till well blended. 8. Serve with foo foo/rice/agidi/gari. Other green leaves for Saturday plasas can be cooked substituting bologie and bitters. 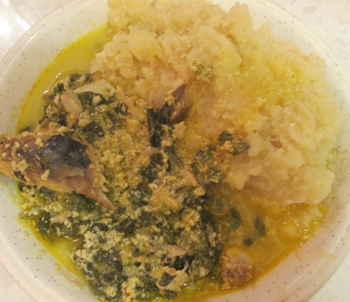 Eg Efonorie, ogumor, bush needle, water bitters, ejefero, cabbage green and spinach (some of these leaves need to be steamed and rubbed a little before adding to the pot.) Bitters could be added or omitted according to choice. Bitter and Bologie is also served for traditional 40 days family cook.